Feel free to call us for any towing assistance you may require to bring your vehicle to our location! Print and bring a copy of this coupon for a discount. For over 35 years we have been doing whatever it takes to be your choice! BMW, Honda, Ford, Lexus, Chevrolet, Mercedes-Benz, Dodge, Toyota, Chrysler, GM, automatic and manual transmission, foreign and domestic - we do it all! And we'll do whatever it takes to be your choice!. We have high standards, and we always strive to better ourselves! Not only we are members of ATSG§, our technicians are also ATSG and ASE¤ certified. Our diagnostic equipment is state-of-the-art to help repair our customers vehicles in less time and with greater reliability. We put the care back into car care! 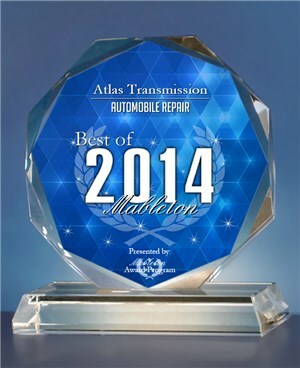 We at Atlas Transmission are the experts when it comes to transmissions and total car care. We are a locally owned and operated shop at the same location for over 35 years. We have compiled some Preventive Maintenance Tips for you .